Makes about 4 dozen bite size pancakes. 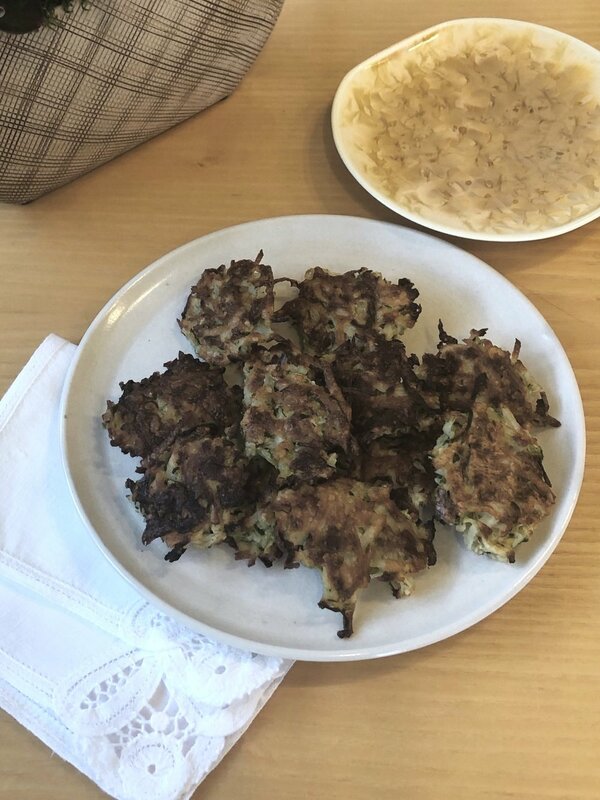 This dish is a nutritious, delicious and light addition to your Passover repertoire. I am quite proud of this recipe. I bake the pancakes and do not fry them. I am thus spared the cooktop mess. I do recommend using heavy non-stick cookie sheets. In addition they can be baked earlier in the day and reheated. They can also be frozen. Finely chop the onion in a food processor fitted with the steel blade. Transfer to a large bowl. Rinse the zucchini, pat dry, trim the ends, grate in a food processor fitted with the medium grating attachment. Wring out the zucchini, in batches, using a sturdy dish towel. Add to the onions. Peel the potatoes, and cut them lengthwise into quarters to fit into the feed tube of a food processor and grate. Wring them, in batches, using a dish towel and add to the zucchini along with eggs and the matzoh meal. Combine well and season to taste. Brush 2 heavy non-stick cookie sheets with the 4 tablespoons of oil. Place level tablespoons, slightly apart, on the greased cookie sheets. Bake on the lowest shelf for 15 minutes or until lightly brown. Turn the pancakes over and bake for another 6 minutes, or until lightly golden. TO WARM the pancakes, arrange them on a wire rack set over a cookie sheet in a preheated 350F oven until hot, about 6 minutes. The wire rack prevents the pancakes from getting soggy. TO FREEZE the pancakes, place them side by side in a plastic container with wax paper in between the layers. Warm the pancakes straight from the freezer in a preheated 400F oven for about 10 minutes, or until hot. 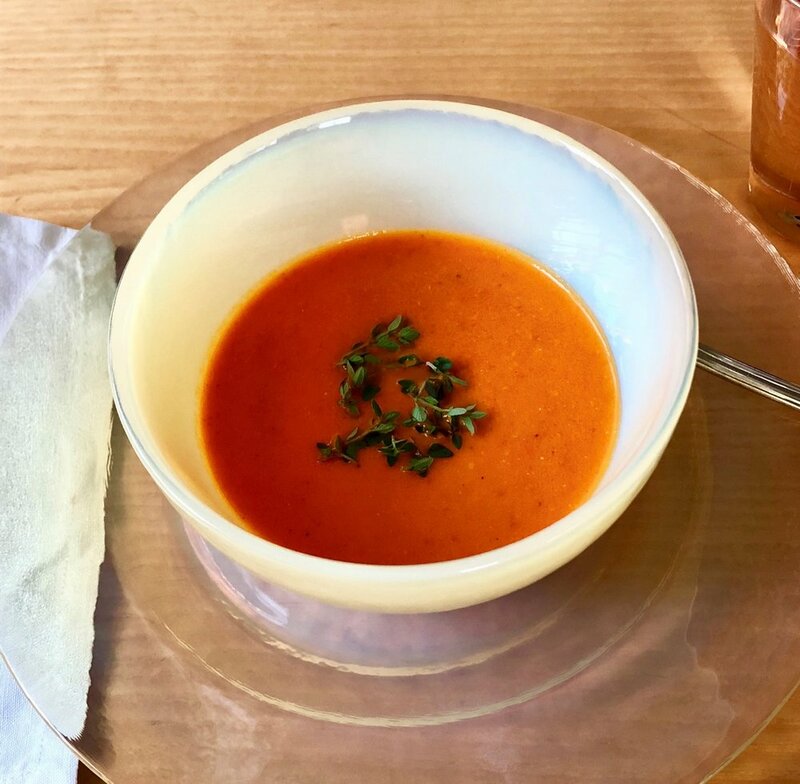 Nourishing, hearty, with a rich flavor of vegetables, tomatoes and basil, this soup freezes very well and is convenient to have on hand for unexpected guests. Peel and cut the onion and garlic into large pieces. Chop coarsely in a food processor fitted with the steel blade. In a large saucepan heat the oil and sauté the onion/garlic for a few minutes. Peel and cut the parsnips and carrots into large pieces. Chop coarsely and add to the saucepan. Wipe the zucchini, trim the ends, cut into large pieces. Chop coarsely and add to the saucepan. Wipe the mushrooms with a damp towel, quarter, chop coarsely and add to the saucepan. 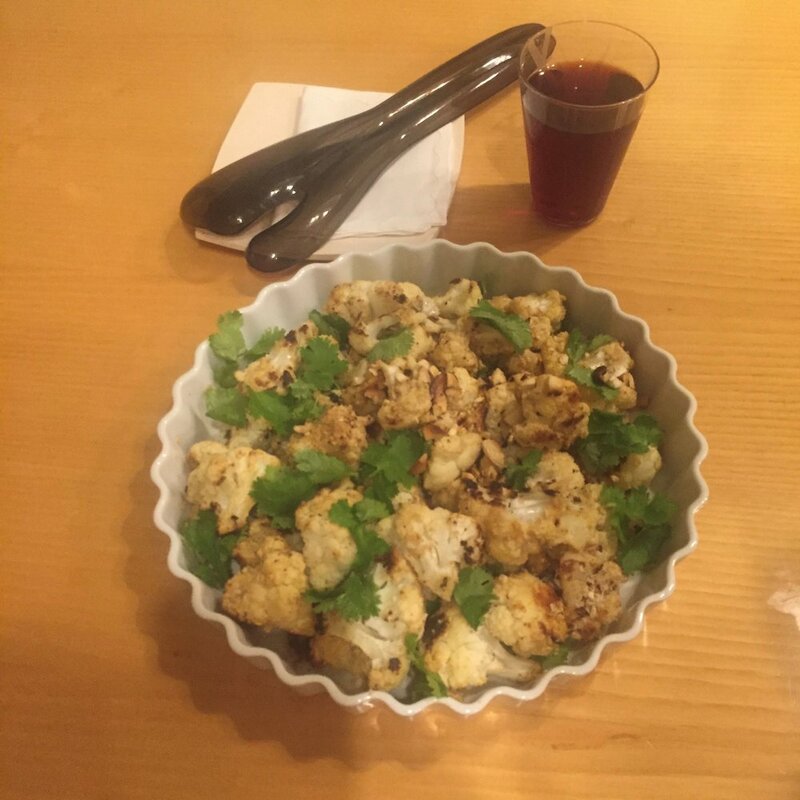 Separate the cauliflower into small florets and also add to the saucepan. Sauté all for a few minutes. Add the chopped tomatoes, vegetable broth, butter beans and basil. Bring to a boil, lower the heat and cook covered for about 30 minutes or until all the vegetables are soft. I chop all the vegetables SEPERATELY in a food processor fitted with the steel blade. It is important to cut the vegetables into large pieces before chopping. I use Pomi brand chopped tomatoes. They come in cartons. Leftover tomatoes can be frozen. I use Goya brand beans. Make 4 – 6 servings. 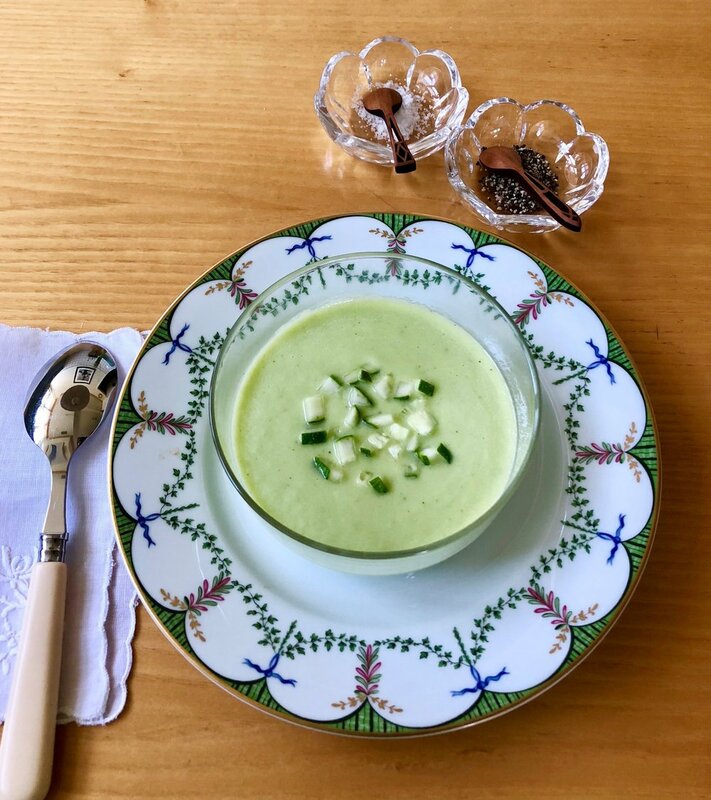 Potatoes, leeks and lettuce make for a creamy, delicious winter soup. ½ teaspoon curry powder, approx. Cut off and discard the dangling roots and most of the green parts of the leeks. Discard one or two tough outer leaves. Cut the white and light green parts into slices. Place in a sieve and rinse thoroughly under cold running water to remove any sand. Drain. Peel the potatoes and cut into small pieces. Separate lettuce leaves, wash and spin dry. Heat the olive oil in a medium saucepan. Add the leeks and garlic and sauté for a few minutes. Add the potatoes, lettuce, curry powder and 2 ½ cups of broth. Bring to a boil over high heat. Reduce the heat and cook, covered, for about 15 minutes, or until the potatoes are soft. Puree in a Vitamix until smooth and creamy. Adjust the consistency with the ½ cup reserved broth. Season to taste with curry powder, salt and pepper. This soup is pure simplicity and delicious. It should be part of your repertoire of soups to make throughout the year. Cut the broccoli into small pieces, peel the stems and cut into small pieces. Rinse. In a medium saucepan heat the oil. Add the onion and garlic and sauté over low heat until soft, a few minutes. Add the broccoli and 2 ½ cups of broth. Bring to a boil, lower the heat, cover and cook until the broccoli is soft, about 20 minutes. Puree in a Vitamix adding the reserved ½ cup of broth, as needed. Season to taste with lemon juice, salt and pepper. Serve garnished with snipped chives. I do not know about you, but for me mushrooms evoke the winter season. This is a simple, tasty dish. It can also be a side dish. 2 scallions including the green part, thinly sliced. Discard the mushroom stems. Wipe the caps with a damp paper towel and slice thinly. Heat a wok, add 2 tablespoons oil, heat the oil, add scallions and garlic and sauté over low heat until soft, about 2 minutes. Add the remaining tablespoon oil and all the mushrooms. Stir fry over medium high heat adding the wine until mushrooms are ALMOST wilted (the amount of oil and wine will depend on the utensil, the heat and the mushrooms. I do not like them too oily, or too wilted, but they are like sponges and absorb any liquid quickly). 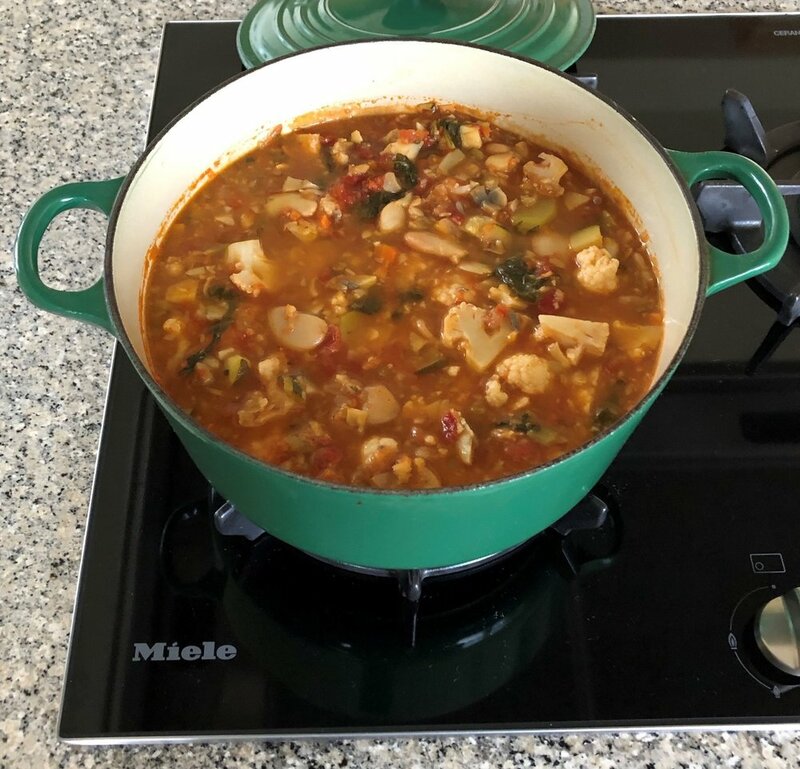 Freezer friendly, thick, nutritious and great on a cold, winter day, this soup can be a meal in itself if cooked with meat. I chop all the vegetables in a food processor to save a lot of time. 1 small Savoy cabbage, about 11/2 pounds or regular cabbage. Place the dried mushrooms in a small bowl, pour boiling water over the mushrooms, cover and let stand for about 20 minutes. Strain soaking liquid through a sieve lined with a paper towel, squeezing mushroom over the sieve to extract more liquid. Set liquid aside. Wash soaked mushrooms carefully to remove any sand, pat dry with paper towels and chop coarsely. Chop the onions and the garlic coarsely in a food processor fitted with the steel blade. Do the same with the carrots. Discard the outer leaves of the cabbage, quarter, core and chop coarsely. Wipe the cultivated mushrooms with a damp paper towel, quarter and chop coarsely. IT IS BEST TO CHOP EACH VEGETABLE SEPARATELY. In a large saucepan heat the oil, add the onions, garlic and carrots and sauté for about 5 minutes. Add the cabbage, both mushrooms, mushroom liquid, tomatoes, vegetable broth and dill. Bring to a boil over high heat, lower the heat then cook gently, half covered for about 30 minutes. The Savoy cabbage will be a little crunchy. Season to taste with salt, pepper. Garnish with dill snipped with scissors. Makes 6 first course servings. A more complicated version of this dish appeared on my website in 2015. With the availability of baby kale, which comes prewashed, I was able to make this dish quicker and tastier. I find it good both warm and at room temperature. Heat 2 tablespoons oil in a wok. Add the scallions and garlic. Sauté over low to medium heat until the scallions are wilted, about 5 minutes. Add the remaining oil and all the kale. Stir over high heat, until kale is just wilted. Add the olives, some of the lemon juice, salt and pepper. In a large pot bring 3 quarts of water to a rolling boil. Add 2 tablespoons salt and the spaghetti. Boil briskly, uncovered, for 8 -10 minutes. The spaghetti should be al dente. Drain well and add to the wok. Combine and season to taste with lemon juice, salt and pepper. Before serving check the seasoning again. I prefer to make this soup when fresh local corn and yellow squash is plentiful. I do not puree this soup. I like the rough texture, the touch of sweetness to the flavor, and the lovely golden color. Shuck the ears of corn and set aside. Put the cobs of corn in a saucepan, add the water and bring to a boil over high heat. Reduce the heat, cover and boil gently for 30 minutes. Cut off and discard the dangling roots and most of the green parts of the leeks. Discard 2 tough outer leaves and cut the white and green parts into cubes. Place in a sieve and rinse thoroughly under cold running water to remove all the sand. Drain well. Rinse the squash, trim the ends and cut into small cubes. In a medium saucepan sauté the leeks and garlic for a few minutes. Add the corn and the squash, sauté for a minute. Add all the cob stock, bring to a boil, reduce the heat, cover and cook for 10 minutes. Very fresh, top quality tuna makes this very easy to prepare dish so inviting. I serve it on a bed of grated radishes with crispy crackers. Cut the fish into ½ inch cubes and place into a bowl. Combine with the remaining ingredients and season to taste. Pat the grated radishes with paper towels; they tend to be wet. Arrange the radishes on a plate with the tuna in the center. Makes 4 luncheon servings or 6 first course servings. This soufflé is easy to prepare and has the distinct taste of squash and cheese. Cut the squash in half and discard the seeds and fiber. Place the halves, skin side down, on a foil-lined pan and bake until the inside is soft, about 40 minutes. Cool. Butter a 1-quart soufflé dish. Heat 1 tablespoon of the butter in a small skillet and sauté the scallions. Scoop the squash from the shells (discarding the shells) and place in a medium bowl. Mash coarsely with a fork, and then add the scallions, egg yolks and cottage cheese. Combine well and season to taste with salt and pepper. THIS PART CAN BE PREPARED AT ANY TIME. Beat the egg whites at high speed until stiff. With a rubber spatula fold ½ of the whites into the squash mixture to lighten it. Repeat with the remainder of the whites, mixing gently. Spoon the mixture into the soufflé dish (place a piece of heavy foil in the center of the oven rack, in case of any drippings) and bake for about 35 minutes. The soufflé should be puffy and golden on top (it rises a little). When a recipe calls for stiffly beaten egg whites the surest way to know whether they are fully beaten is to tilt the bowl. If the egg whites stay when turned over they are ready. Makes 6 servings as a first course. 4 servings as a main course. This pasta is easy, flavorful and nutritious. The sauce requires no cooking, and only the pasta is boiled. 4 tablespoons lemon juice, approx. Soak the anchovies in cold water for 5 minutes – drain and pat dry with paper towels. Place anchovies, garlic, basil and parsley in a food processor fitted with the steel blade. With the motor on, pour the olive oil and lemon juice through the feed tube. Pulse until smooth, transfer to a large bowl and combine with the tuna. Bring 5 quarts of water to a rolling boil in a large covered pot. Add 2 tablespoons salt and all the pasta at once and stir. Boil briskly, uncovered, for about 7 minutes, or until pasta is al dente. Drain well in a colander and toss with the sauce. Season to taste with salt, pepper and lemon juice. 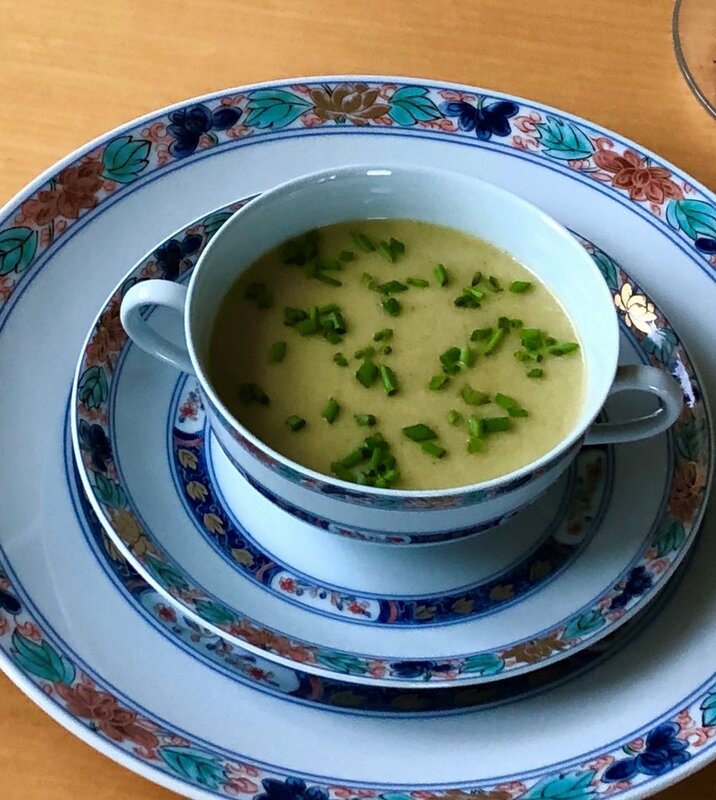 This soup has a silky, creamy consistency without the addition of cream, a beautiful pale yellow color and a touch of sweetness. The ingredients for the soup are readily available all year round. The inspiration came from Mexican cuisine, which is rich in corn, lime, and cilantro. 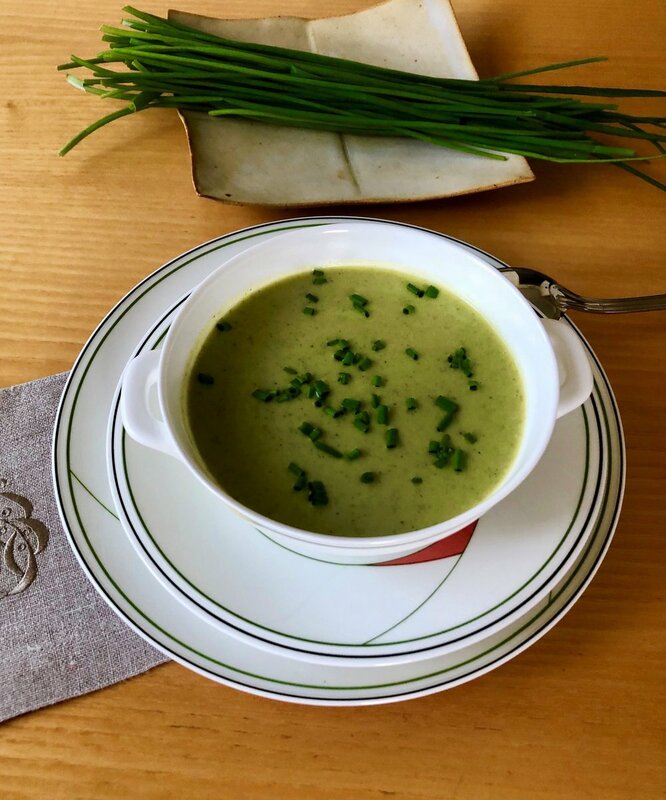 I am featuring a revised version of this soup, one of my favorites, because the advent of Vitamix makes this soup so easy to make. In a medium saucepan heat the olive oil, add onions and garlic and sauté for a minute. Add the broth and the corn. Bring to a boil over high heat. Lower the heat and cook, covered, for 20 minutes. Season to taste with lime juice, salt and pepper. The ingredients for this delicious, creamy soup are available all year and it freezes very well. Like most of my soup recipes, you can make it in advance. 1 teaspoon Madras curry powder, approx. Cut off and discard the dangling roots and most of the green part of the leeks. Discard one or two of the tough outer leaves. Cut the white and light green parts into slices. Place in a sieve and rinse thoroughly under cold running water to remove any sand; drain. Heat the olive oil in a medium saucepan. Add the curry powder and stir. Add, the leeks, lettuce, peas and 2 ¾ cups broth. Bring to a boil over high heat. Reduce the heat and cook, covered, over low heat, for 15 minutes. Adjust the consistency with the ¼ cup reserved broth, as needed. Season to taste with curry powder, salt and pepper. Garnish with pepitas. After freezing you may need to whisk the soup to restore its creaminess.